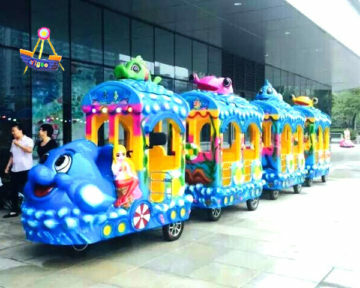 Ocean Theme Park Ride Electric Trackless Train For Sale, Cheap Electric Trains For Adults.Ocean Trackless Train BESTON Co.,Ltd designs, builds and sells one of the most authentic-looking, attractive and affordable trackless trains in the world today ! We manufacture diesel and electric powered trains sized for both children and adult riders. Whether you’re wanting to start a ride business, adding to an existing business, or looking for a unique attraction for your organization, a Beston Train is the perfect choice! Beston Mini-Express Trackless train for sale is a quiet, safe and environmentally friendly electric train. While many other companies build their train rides from a third party industrial vehicle, the trackless train by Beston is totally built and assembled at our factory. Because of this, we has the relatively low price and the high cost performance quality. The trackless listed below are our hot-selling ones and all can be directly made by us, choose the one that you like most and contact us now! Trains have been part of tradition for generations, children and adults alike have been fascinated by trains.Trackless train — or tram(U.S. English), road train, land train, parking lot tram, Dotto train, tourist train, barrel train, mall Train or Choo-Choo train — is a road-going articulated vehicle used for the transport of passengers, a road going railway train. Often, the train ride itself is a tourist attraction too, offering sightseeing along scenic routes as well as a transport service. Electric trackless trains are also used in shopping malls to entertain children while their parents are shopping. It can also be used in theme park, shopping center and other entertainment place. Some trackless train for kids are functional or modern in appearance, many are often constructed with false bodywork and are painted to look like nineteenth century steam trains. Others may feature decorative or fun paint schemes to appeal to children.